Now that you know your best colors and the styles that suit you best you're no doubt dying to go shopping. However, before you rush out the door to spend money let's go visit your existing wardrobe. What's that I hear you say? Scary thought? Don't worry, I'm here to guide you. And it will be well worth the effort. A working wardrobe is one that functions well for your current personality, coloring, body shape, age and activities. It means you'll always have something just right to wear for every occasion. Get rid of the garments and accessories that are not flattering, that you're not wearing or that are worn out. And organize your garments by type and color. This step allows you to see exactly what you do have and makes room for purposefully chosen new items. For some of you it's also the most painful step! However, it really is essential to your wardrobe makeover. Follow the approach detailed here. With a detoxed and organized wardrobe it's time to take stock of what you have and what new outfits you can make by combining your existing clothes in new and exciting ways. As you go through your current wardrobe auditing and planning you will identify what you need to complete outfits and what entirely new outfits you could use. You don't need a lot of clothes, clothing capsules are the key. 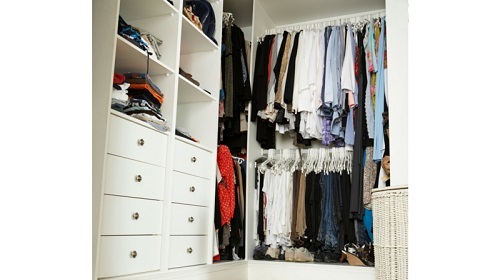 After your wardrobe audit you should have a prioritized list of items to shop for. Maximise your shopping efficiency and success by researching the shops you will visit. You need shops that sell the items you are looking for and whose clothing styles suit your style personality. Read more clothes shopping tips here. And now, finally, you're fully prepared to go shopping! Don't forget to take your color swatch, style shopping guide and shopping list with you.